Global Entertainment R&D Dept. 2, Red, H.I.C. 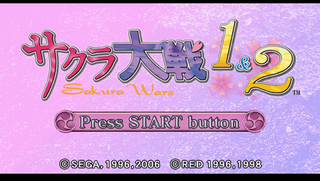 Sakura Taisen 1 & 2 (サクラ大戦１＆２) is a PlayStation Portable compilation containing Sakura Taisen and Sakura Taisen 2. Main article: Sakura Taisen 1 & 2/Magazine articles.